Service was pretty good, but the food was 50/50. I got boneless wings, and they were slightly cold and soggy... My sister got bone-in wings and loved them. Other than my boneless wings, our visit was good. The rest of my family’s food was good. We dropped into this restaurant for a quick lunch on a Sunday because it was close to our hotel and it seemed to be quite popular with the locals. 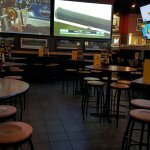 Primarily a sports bar and grill, it seems more suited to serving sports teams than couples. However, we had a server who was very helpful, patient and seemed quite determined to ensure that our eating experience was going to be quite acceptable, By and large, she was successful, with the small exception that we had to make several requests fort a glass of water with our order. Other than that, the food was quite acceptable and the service was very good. Our family of four stopped in for a meal that included everything from wings, caesar chicken salad, to a grilled chicken sandwich. I ordered the caesar chicken salad and was disappointed in all aspects. 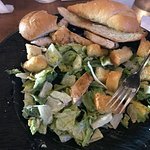 The entire salad was bland, the chicken had zero flavor, the caesar dressing was watered down and the lettuce reminded me of something you'd dump out of bag of 'ready to eat lettuce' from your local grocery store. It came with garlic bread which was no more than a hoagie bun cut in half, toasted with some garlic salt. From my photo, you can tell the other family members piled their bread on my plate...no one would eat it. I left 75% of my salad behind. I've given this location numerous opportunities and don't plan to go back. Food was fresh and well prepared. No complaints. Friendly crowd. Parking was crowded in front but ample parking in rear. Been to Buffalo Wild Wings? Share your experiences!